Printed bookbinding paper product manuals have been provided with Yokogawa's control systems represented by CENTUM CS so far. In 1997 and 1998, new production control system CENTUM CS 1000 and integrated production control system CENTUM CS 3000 (hereinafter referred as CS 1000/CS3000) were released one after another, their operation and the engineering functions run on the open-architecture Windows NT. In cooperation with the new product development, we achieved to provide users the documents and online manuals in electronic data for the first time. So that our company has broke away from the paper documentation era. The file format and the electronics data are PDF (Portable Document Format) compliant, copyrighted by United States Adobe Systems which has been widely accepted as the standard electronic document format and the internet document format on Web. The needs for paper documents are also taken care of in our electronic document construction. 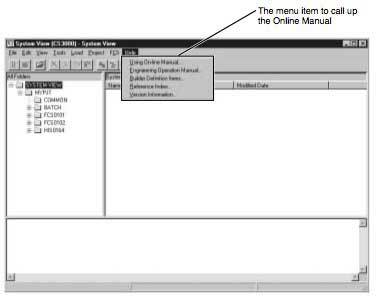 This article outlines the planning and production of the electronic documents for CENTUM CS 1000/CS 3000 functional online manuals. The manuals of control systems such as a DCS provide a vast amount of information depending on their multi-functionality and functional integration. A conventional large-scale control system our company offers comes with more than 10,000 pages of paper documents. Manuals of those systems are a practical way to produce original information about the operational verifications of products in accordance with development specifications issued from the Product Development Department, and to edit it into book-bound information for each system function block, such as operation functions and control functions or information for each product software package. However, the wide dispersion of information on CD-ROMs and electronic media on the Internet has disproved the concept that "a document equals paper." 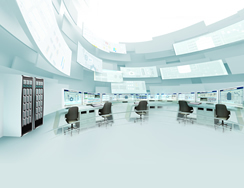 To meet the needs of the time, Yokogawa has planned and produced electronic media to replace manuals for control systems, and has developed control systems bound for the open and global markets. It has also completed both Japanese and English versions of electronic documents for the CS 1000 and CS 3000 series products. Electronic documents for the CS 1000/CS 3000 offer a vast amount of information not only via CD-ROM media, but also by online manuals included in the control system, that make full use of PDF properties, and paper documents that are excellent for quick reference. 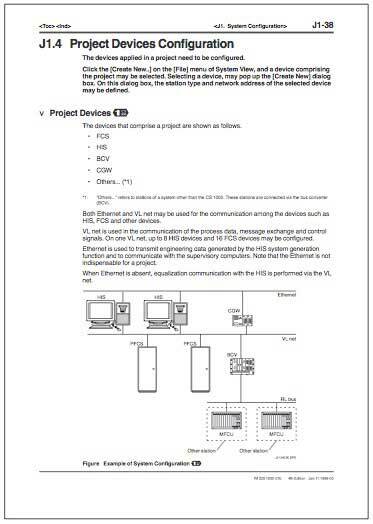 Yokogawa established a project team for the purpose of improving product manuals several years ago. The project team has mainly grappled with the following subjects. Subjects regarding the systems between the Product Development Department and documentation personnel. Subjects regarding documentation including the presentation media, authoring tools, and documentation cost. Subjects regarding the quality of manuals, including the solicitation of user requests and improvement measures. In the process of discussing these subjects, the project team started electronic document planning and electronic media became an essential component of document presentation media. According to the needs of the time for electronic media, the widespread use of highly functional PCs, and the presence of international de facto standards such as PDF and HTML, it has become essential to plan and produce electronic-based documents. The following points were taken into account when planning electronic documents. Comparing electronic and paper documents, and the proper use of them. Selecting DTP (Desktop Publishing) tools and electronic tools. Reducing the production period of documentation and producing concurrent Japanese/English versions. Utilizing intranets and the Internet. CS 1000/CS 3000 electronic documents were planned and produced in accordance with the policy of supporting flexible maintenance for future changes in technology and situations, in addition to improving the problems associated with conventional documents. Especially when a document such as an online manual was planned, mutual cooperation between development department personnel and documentation personnel was indispensable, since the document requires an interface with the product system software. This led to the policy described below. Since the product documents are an important part of the product, the highest priority is given to synchronizing the documentation with the product release schedule. Also, the Japanese and English versions of the documents should be released at the same time. The offering of product documents on CD-ROM in the same way the product system software is supplied. The documents are laid out so that they can be offered either on electronic media or on paper, with consideration for bookbinding. The total size of the documents should be reduced. The complete documents should be structured such that their readability is the prime purpose. They should not stick to such a structure as the conventional system block for each function of the development specifications or for each software package. Tools and devices suppress the increase in documentation man-hours required due to the production of electronic documents or the usage of new techniques. It was the first attempt to put thousands of pages of control system documentation into online manuals. Prior to starting this documentation a significant amount of time was spent on document planning. For readability that is compatible between documents on a CRT and paper, it became necessary to examine the following guidelines. User interface including startup and link. Structured documentation appropriate for browsing information. Expression of indexes, lead sentences, reference cues, etc., that are understandable at a glance. Rules for producing characters, figures and tables, templates, etc., and rules for data storage. Information management of version numbers, documentation date, etc., that are interchangeable for each page. Expression of security, PL measures, trademarks, and copyrights. Taking these guidelines into account, we listened to users in various fields, identified all the described items, then devised a detailed plan and design for the entire documentation policy and structure including the table of contents for each document. In planning, the emphasis was put on the following items. To offer the necessary information to those who need it, the intended readers should be clearly defined, such as engineers, plant operators, and maintenance personnel. The documents should be clearly categorized by their objectives— one that must be read, and ones for reference, thus reducing the number of documents that must be read. The documents should be well structured so that they are easy to read and easy to revise if the product specification is modified or if the documents are to be altered for use with other product models. The documentation development methodology should adopt the structured programming methodology of software development. This methodology results in a easy-to-read and standardized document that can be produced in a short period of time. CS 1000/CS 3000 documents should be prepared so that they can be provided on CD-ROM. These documents should also be laid out with consideration for bookbinding and the printing of specific pages on demand. PDF should be employed as the data format of electronic documents. While making the most of PDF files, a function equivalent to situation-dependent help is implemented. Acrobat Reader supplied free from Adobe Systems Inc., is redistributed with the CD-ROM for use as the PDF browsing software. Each PDF file is designed such that the standard Find function of Acrobat Reader can be used. To improve the browsing performance for retrieving the desired information, an electronic document should be provided with link settings (linking to related information), which is a convenient PDF function. Link resettings may be required if document revision increases or reduces the number of pages; unnecessarily complex link settings should not be made. The information required first by the user and the designation of PL, trademarks, etc., should be presented with paper documents accompanying the CD-ROM. Revisions to each document are informed to respective overseas offices and translated into various languages, and hence they should be supplied in detail to users all over the world. One point of the documentation design is to achieve the "Create Once Use Many Times" concept and also to be aware of the data structure that can be utilized in the future. It is a matter of course that the design conforms to the basic rules of technical communication associated with general documentation. We rolled out the CENTUM CS 1000, and then CENTUM CS 3000 within a short period of time. 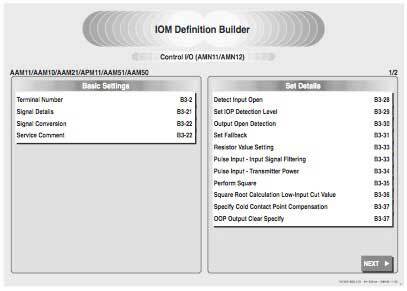 They have many common functions in their control systems, and both models have a significant amount of descriptions overlap in their documents. We applied the concept of "Use the same source for all applicable purposes" and isolated common functions from functions, which differed between the models. 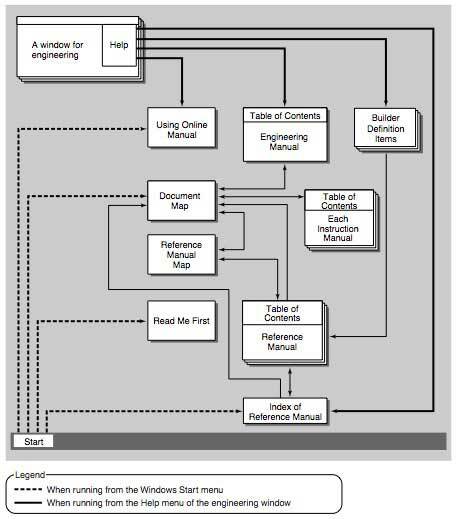 In the development of the CS 3000 we restructured the document map (Figure 1) to common manuals and individual manuals, compiling the CS 1000 and CS 3000 documents into one set of documents. Additionally, the pictograms that indicate each definition shown in Figure 2 are used in documents so as to denote at a glance CS 1000 and CS 3000 specific parts. This makes it possible to improve the efficiency of the next revision and to greatly reduce the number of pages. The page layout is designed in consideration of browsing a manual on a CRT, printing the necessary pages on demand, or reading the manual as a book-bound document. The layout of the body, table of contents, index, etc., was determined with the aim of readability within the permissible range for both browsing on a CRT and reading in black and white printed form. For the ease of identification the number of colors are kept to a minimum with information required for browsing on a CRT and the information required for the printed version. Documents are printed in A4 size, but only about half a page can be read on a CRT without scrolling. Also, since the English version has a little more volume of text that the Japanese version, the English version is likely to have a page break if the corresponding text in the Japanese version runs to the bottom of the page. A page break may result for the same reason if any description is added in a revision. Taking this factor into account, the page layout was designed so each page has as large a space as possible at the bottom of the page. The main design items are listed below. These items are all specified as a style on the DTP tool and produced on the basis of its template. This style has achieved the readability of paper documents and has high visibility on a CRT. Colors used in the documents. Colors of symbols related to the PL Directive, such as "DANGER"
Rule for a page break and starting a new section. The layout example of a manual body produced in consideration of these design items is shown in Figure 3. The user interface has implemented the information retrieval capability that allows a description that is possibly dependent on an operating situation to be referred to or browsed, in addition to the PDF properties that allow an electronic document to be browsed and retrieved using the Acrobat Reader, and the contents as viewed on a CRT to be printed on demand. This interface provides a document in the PDF file format that can not only be read with the Acrobat Reader, but can also be improved for use as an online manual for system software. 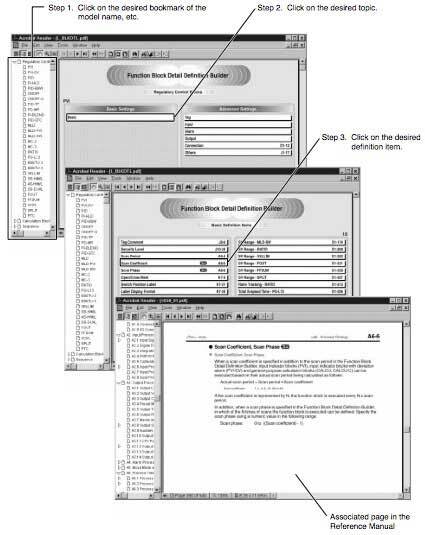 Practically, the user interface uses the developing tool in the Acrobat Reader's browsing function, and also allows the document on a CRT to jump to the desired topic by setting links in a PDF file. The interface provides especially easy access to the desired information when referring to detailed information about the engineering item from the window for performing engineering work. The major items of the user interface design are described below. The information retrieval capability has been improved through appropriate links. Approaching each manual from the document map. Link (jump) to a relevant page from the table of contents or index. Installing a link button in the page header. Starting from the builder window to perform engineering work. Designing a definition item list file (Figure 4) in which engineering items are listed. Setting definition item names (keywords) in a body to which to link (jump). The items to be discussed concerning the design of PDF files include the directory structure and file names in a CD-ROM, and the display magnification, thumbnails and bookmarks, to be set. Also, electronic documents require a rule for security and must be designed such that trademark and copyright descriptions, as well as precautions can be easily identified by users. The major items for file design and their advantage are described below. The format of data stored in a CD-ROM conforms to the ISO9660 Standard and is compatible with various platforms. This allows a document to be browsed without being dependent upon specific environments such as Windows or UNIX. To make a PDF file easy-to-use, the display magnification appropriate for the system display is set and a thumbnail or bookmark is created. Also, the document information is set as important information for controlling documentation dates and revision data. Security requires a rule in the future. CS 1000/CS 3000 electronic documents specify the settings for browsing, printing, and text/illustration data. This allows this data to also be used for other operation manuals. Information including PL precautions that should be read first by the user after unpacking is supplied with paper documentation, and is located such that the user can easily find a README file in an electronic document. It is regrettable that the functions cannot be actually shown. We have achieved the first installation of the electronic documents on the control system by putting stress on document planning and design. There are about 6,000 pages of documentation and 25,000 PDF link settings in the most recent Japanese version. The numbers are similar for the English version. 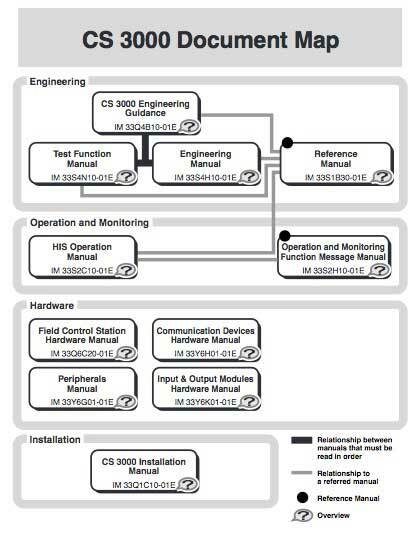 Figure 5 shows the calling relationship between the CS 1000/ CS 3000 online manuals. There are two methods of retrieving the required information, as shown below. The setting of links in the reference manual enables the user to freely browse between documents. Starting from [Document Map] or [Reference Index] in the Windows Start menu. (Figure 6). Starting from [Help]-[Builder Definition Items...], or [Reference Index...] in the Builder window for engineering work (Figure 7). The definition items in the window of the current engineering work are displayed as a list by calling them from the Builder window. By selecting an item the engineer wishes to inquire about from the list, the page where the item is described can be jumped to (Figure 8). The definition item list changes the display contents for each Builder window. In other words, the definition item list is a sort of situation-dependent online manual. There are various methods for retrieving information. The general retrieval procedure is given below. The objective information can be accessed by approaching each manual from the document map, or by retrieving the information from a main index item and definition item. Opening a document to be browsed from the document map. Opening the relevant page from a term in the table of contents or index. Opening the relevant page from [Help] on the Builder window. Searching all the text and figures/tables with the retrieval function in the Acrobat Reader. Since the Acrobat Reader's retrieval function searches all data in the currently open field, the reference manual PDF is designed so that each block of related functions consists of one file. This has improved the retrieval-hit rate. The Acrobat Reader's print function allows the currently displayed page to be printed on demand or one volume of the document to be printed in its entirety. The PDF property reproduces the printed matter that has to be laid out on the screen and allows it to be printed in high quality. The CD-ROM includes files with the cover, foreword, etc., which are not directly related to the online manual. With this CDROM all files related to one volume of the document can be printed in their entirety, and then the CD-ROM is available as a paper document. CS 1000/CS 3000 electronic documents are presently planned and designed by taking into consideration the engineering work. In future it will be necessary to map out a plan to produce an online manual dependent on the situation of the so-called plant operation. Users require an online manual from which they can quickly access information about various events that occur during plant operation. Also, approaching is a wave technological innovation in DTP and other electronic tools. A de facto standard may appear in place of the PDF file format. With a close eye on such technological trends, it is necessary to produce more user-friendly electronic documents and electronic documents that have greater reusability. With respect to the conventional distribution of documents, a great number of man-hours and cost is required to pack and deliver paper documents. Electronic documents, however, can easily be distributed through CD-ROMs or transmitted via an intranet or the Internet. However convenient and advanced the electronic document technology and tools are, primary importance must remain attached to the content rather than the form. With attention to user requirements, we intend to create electronic documents that have a sophisticated user interface and enriched content.